← Are you a 40 year old mediocre? Determine and prioritize how you want to live different aspects of your life. To this day, my favorite personal learning video is Big Rocks by Steven Covey. In this genius video, he demonstrates the biggest mistake people do by spending their time on small things while ignoring the big things. While the original video is more than 10 years old, the concept is more relevant than ever. Somehow, we started living our life on an autopilot through a set routine where small issues and distractions become the most of it and there is no place to pursue bigger and more meaningful things. So, one of the main interventions (as shown in the video) is to become mindful of what you want to achieve and put them into priority order to fulfill the time. So, when I applied the same exercise, I found out a fundamental mistake that caused massive tension in my life. While I always put my family first ahead of my career in terms of importance (like many people with families), I was actually prioritizing work ahead of my family in time planning. As a result, I was living in a constant tension, juggling between my demanding full-time work schedule and requirements for family. So, I made a constant choice to spend my time differently: My family first. I placed my career as second. This had a tremendous transformational impact on my life. Although I had great ambitions for my career, I decided to pursue them only as long as I secure a happy family life where I give my 100%. Just like baseball, family became first base instead of career. If you don’t cover it, you don’t run to the second. For example, this meant that I had to leave work at 6 pm no matter what. I know many people who say the same but they can’t apply it. Why? Because in their minds, career is still the first. Knowing and not doing is not knowing (Buddha). So, once I secured my first base, it was time to deal with the others. I placed them as career, physical well-being, financial security and developing myself and others (reading, blogging & mentoring). Having set such clear priorities, crystallized my choices to act. 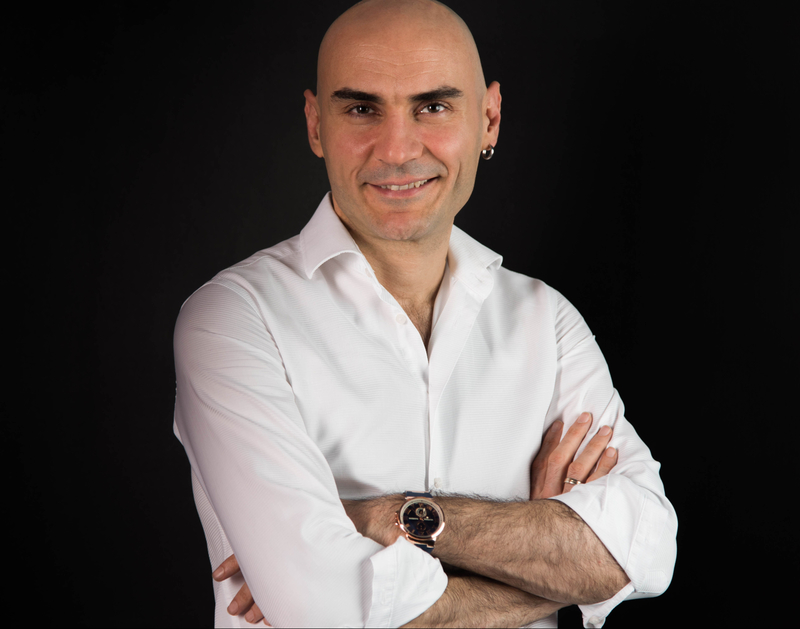 Here’s a great video by Dr Adizes, an iconic business consultant who talks about the importance of family and relationship to the success of the person. By the way, I, in no way think that putting career to the center of life is ever wrong. On the contrary, there are people with phenomenal drive and success who achieve amazing things by giving themselves fully to the work they do. No, this is just a method to clarify what’s important for your and align your life and time choices to live it to the fullest through a routine. So, what’s next after determining what’s important for you is to determine what it means to have fulfillment in that area, and how you can allocate regular time for it. Create the weekly calendar by 15-minute intervals to determine how you allocate time. if you feel like you’re constantly being run by your schedule and you don’t have time to do things you want to achieve in your life, it’s most likely because of the way you live your routine. Once I set my family as priority, I was surprised that I couldn’t clearly define a regular and specific activity plan to be a good father and a husband. So, I decided to approach this question like I approach my work. Who could give me the best feedback? My wife! So, I went to my wife and asked her what I should do to be a good husband for her and a father for the kids. While my wife was pleased with the question, she laid out series of requirements which I noted down to fulfill my weekly bucket. Wake up to prepare our daughter for the school (Done, 7:30). Long walk with family in the weekends (Done, Saturday/Sunday between 10:30-13:00). Come home no later than 19:30 (Done, leave the office at 18:00 latest). Spend one-on-one time with our daughter after work (Done, 20:45 till 21:30 everyday except Wednesday, 18:30-19:30 every weekend). We then went on to schedule when we want to have dinner, our couple time after kids go to bed, family activities and plotted them in our new weekly routine. While it looks like a nerdy exercise, having done this had a tremendous effect in our life. There were three main benefits which I discovered in retrospect: First, I had a clear understanding of what I need to do by when to fulfill my family life. 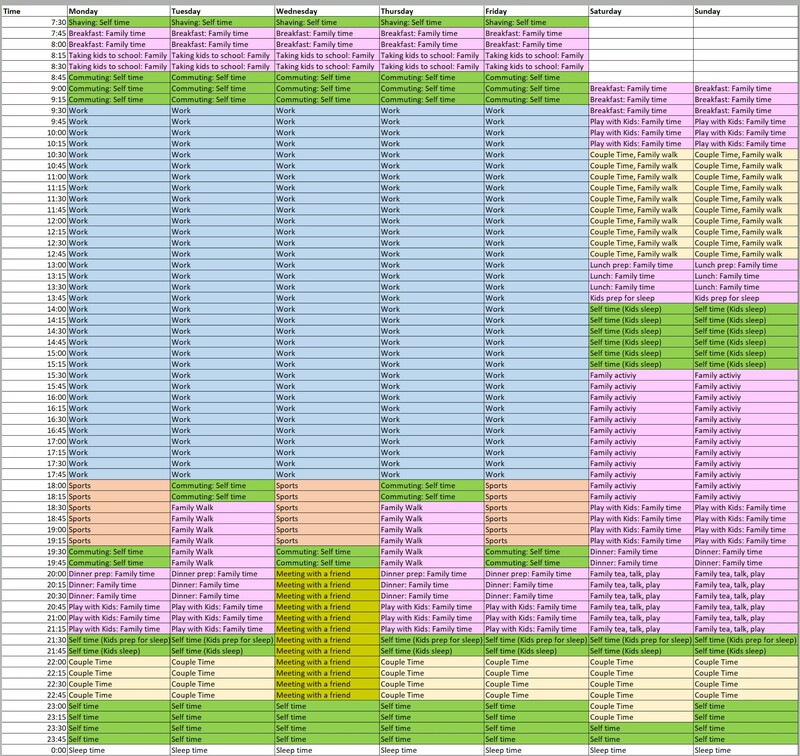 Second, it gave me a clear opportunity to plot the time for my other interests and priorities. Third, it had significant positive impact on my marriage due to my responsiveness to my family’s needs. After all, you plan your schedule at work, why not schedule activities in more details in your family life? So, this brought me to make serious choices. For example: Reaching my career goals can’t happen through working over-time. So, to achieve success at work, I had to be more selective and courageous in doing the right things and never allow myself to compensate for the lack of strategic focus by over-working – which is a sign of under-thinking. While this topic is very broad, I wrote series of articles about turning around your business, unlocking the power of people, getting a fast promotion and teaching yourself to be smart which were some of the methods that made me more effective at work than my previous self. Allocate time for physical well-being and fun, aligned with your partner. Here’s a cliche: A guy meets with his friends for poker on Thursday night and watches sports during weekend. His wife is upset. If you ask him why he does these things, he would answer that because he enjoys them. But why would then his wife gets so upset with the love of his life enjoying his life? It’s because she’s not getting the attention and time of the man in the first place. As a result, every out of home activity becomes an issue which is a symptom of the underlying issue – not enough time together. Here’s an amazing video where Tony Robbins identifies this issue and saves a failing marriage in 8 minutes. That is why, it is utterly important to determine how you spend time together, namely, securing family and couple time in your routine first. Once this is fulfilled, couples do want each other’s happiness. I don’t claim to be a marriage expert. But in my experience, once we decided on family and couple time, it was OK for me to allocate time for sports three times a week after work and meet with a friend on Wednesday nights which was well endorsed by my wife. Set regular time for discovery, self-development or giving back. In business, even if you have the best product, you need to invest in research and development to keep your competitive edge and capitalize on new opportunities. Our lives are no different. While we need time for our loved ones, sports, barbecue weekends, we also need time to meet new people, pursue new opportunities, learn new skills and even discover ourselves further. Whenever I share the ‘’Routine’’ planning approach with other people, the number one question I receive is: Isn’t it boring to live life like that? My answer is opposite. Counter-intuitively, while ‘’the routine’’ approach decreases unpredictability, it increases surprise and excitement. If you set each Wednesday night to go for dinner with an interesting person, you would be amazed at how fast you grow your vision, knowledge and friend network. If you dedicate every Saturday afternoon to a new family activity, you can discover, aqua-parks, museums, concerts and sport matches together. If you set a date night with your loved one, you can discover new restaurants, recent trendy places and most importantly each other. Everybody also needs a me-time for relaxation, self-discovery or self-development. The beauty of this approach is, whatever you want to explore next, you put it in the next available slot in your routine. Use time-mining to make yourself time-rich. I guess by now, you have a better understanding of how to start with priorities in life and set time for each other in your daily routine and add fun, discovery, give-back time in priority order. But what if you don’t find the time in your routine to add one more aspect to your life? Or the activity takes too much time which you don’t have in your routine? In this case, you need to apply a technique that I call ‘’Time-mining’’. It’s like searching for hidden golden buckets of time in your routine despite not obvious at first sight. Let me give you an example: We went public in London Stock Exchange, as I led Russian business. I admit that at the time, I didn’t have enough knowledge to keep up with the process. But I also couldn’t attend an MBA or any other course which required time away from my family due to the birth of my second kid. In one of my business trips, I saw a TV screen embedded in bathroom mirror which allowed to watch the news while shaving. I told my wife about this and she ordered a smartphone sticker on bathroom mirror for 5 dollars, to watch while shaving. So I decided to use my ‘’shaving time’’ to advance my knowledge on fundamentals of corporate finance to go public. First, it looked like a futile attempt. But after I watched 10-minute videos almost every day for 3 months, I almost closed my knowledge gap. By applying time mining, I transformed an ‘’unproductive’’ slot in my routine, with the help of a little creativity into a learning opportunity which paid out in spades. This was one of my biggest breakthroughs in managing my routine and it helped me to become a more skilled executive. So, what is it you do that you can combine with a productive activity? Listening an audiobook while jogging? Going to lunch with a friend who can give advice about personal finances? Meditating while commuting? The more you look at your time this way, the more you see productivity opportunities around you. Ultimately, by digging time out of your routine, you become time rich to do things you aspire to do. Routine doesn’t prevent spontaneity. What if your friend has a birthday on the weekend? Or your boss invites you to business dinner during your sports time? Or your daughter has a show at school during your office time? Or you just simply want to sleep longer and wake up at noon in the weekend? Well, I think, by now, you understand that routine is not a schedule but a mindset combined with a set of behaviors to live your life to the fullest. So in case you’re faced with such questions, then my answer is ”Do what makes you feel happy”. Some people would attend the business dinner and others would skip it to follow their sports routine. Both have consequences. Routine is not about the doing the same thing all the time but having a general blueprint to use your time wisely. If you are down after work on a weekday, nothing stops you from calling your best friend to feel some sympathy and skip your routine. It’s also not about feeling guilty when you don’t follow it but rather be mindful of it when you make your time choices. Some people sleep eight hours a day, some less and some more. It’s better to plot how much time you need regularly, but feeling the freedom to go to an unplanned party and stay late. Think about it as having a healthy diet most of the time but indulge yourself in a juicy burger once in a while when you feel like it. You don’t miss out on small indulgences but you build yourself to a better long term. Your spouse is your best friend. Whether you’re married, in committed relationship or single, your routine depends on other people. You can’t re-draw your routine yourself without the input and support of your partner. So, when it comes to problem solving, my wife is my best friend. Mother Theresa said: ‘’If you want to change the world, go home and love your family’’. Having put all the family and one-to-one activities with my wife as first in my routine showed her that I walk the talk when it comes to ‘’family being first’’. It liberated us from tension and helped us work out the rest of the plan. It helped us to meet with new people, experience newer family activities, discover and develop each other and be better versions of ourselves. Despite I placed career in a secondary place in my life, this decision alone helped me to cut to the chase at work and ultimately reach new heights, including an IPO and growing my personal business in parallel. So here are my tools. If you’re ready for action, I suggest you to define your priorities, plot them in your routine and bring it for discussion with your partner. We are what we do. 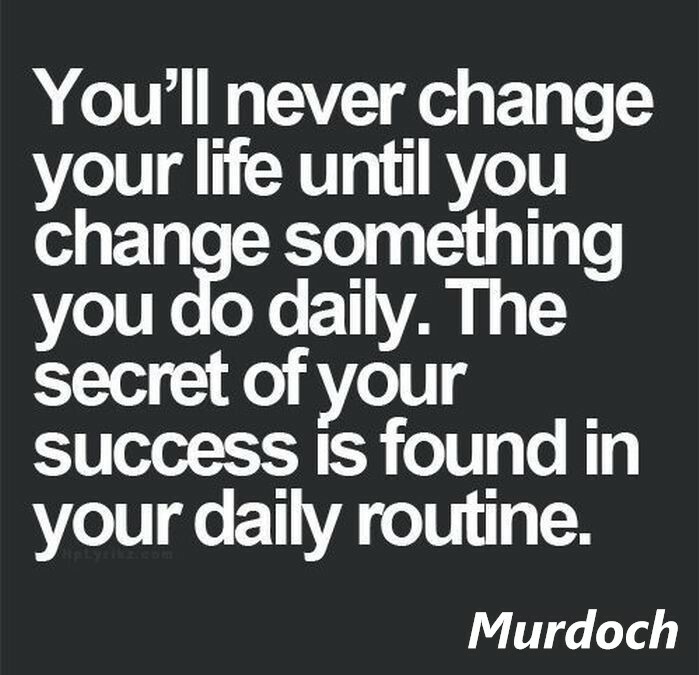 The future of your success is hidden in your daily routine (Murdock). This entry was posted in Career, Productivity and tagged гувенч донмез, гюванч донмез, гювенч донмез, extraordinary life, Guvenc Donmez, living an extraordinary life with an ordinary routine, routine, time mining. Bookmark the permalink. Guvenc, its another great article, I liked a lot the recommended videos and books as well, especially the video by Dr Adizes. Thanks a lot for all the wisdom and practices shared! Guvenc, its another great article! I liked a lot the recommended videos and books as well, especially the video by Dr Adizes. Thanks a lot for all the wisdom and practices shared!